As I am collecting medals from all of my races, I wanted to have something to show them off and dictate how far I’ve come on my running journey. Traveling for races and visiting the expos, I’ve seen various types of running medal displays in which I thought were nice, but a little pricey for my budget. I’ve always considered myself a creative do it yourself girl, so I decided that I would create a unique medal display hanger. This was my labor of love and inspiration overnight project. I went to Home Depot and Lowes to buy my materials. Chalk board, screw in hooks, wood glue, picture hangers and some wooden planks to secure the back of the board was all that I needed to complete it. It cost me less than $20 to build it compared to the $50-$75.00 I would have paid for one already made. Besides, it wouldn’t have been as unique as mine. 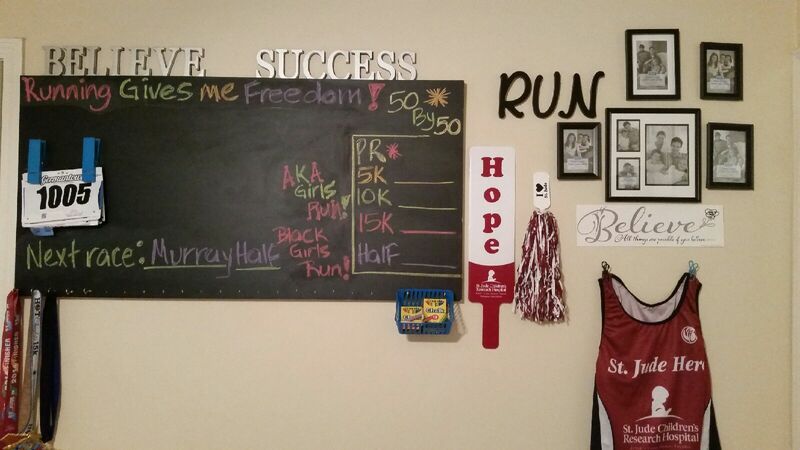 I wanted the board to serve multiple purposes such as to hang my medals, race bibs, keep track of my past pace and current training goals, and to write down affirmations and words of encouragement. Making this board was really easy and fun to do. After finishing it, I realized I wanted a wall with pictures and memorabilia dedicated to my running journey. As my journey progresses, I can add more picture frames to my wall and change out my race dates and affirmations on my board according to how I feel. I’m a visual person. If I see it, I can affirm it, believe it and put it into practice. This promotes a positive and healthy self-esteem as well as a pick me up on those not so good days that we all have. I’m excited about all the possibilities that are in store for me. As the meme states, you need to find 3 hobbies that you love…one that makes you money (Beaux Cadeaux http://www.thebcgiftcollection.com) one to keep you in shape (running and working out) and one to be creative (creating new healthy recipes, my blog, inspirational posts and helping others achieve their goals using creative outlets). I’ve found my three. In order to live a well balanced life, you must learn how to work, play and live well. My career, social life and healthy living keeps me fit and free from some of life’s issues. I can’t avoid them, but I can choose how I react to them and meet them head on. Find your freedom and choose to live well.